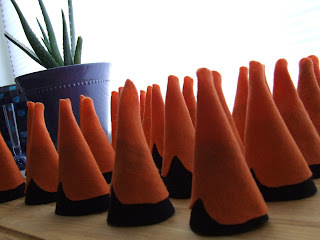 I haven't posted much about this month's edition of the homeschool book club because I am not the primary presenter this time around, but I did get to have some fun figuring out how to simplify a craft idea for the younger kids. The Big Kids are reading The Trumpet of the Swan and the Little Kids are reading this version of The Ugly Duckling. One of the girls in the older group suggested E.B. White's classic tale and wanted the opportunity to lead the discussion. She has come up with a few questions, an interesting experiment in communication, a snack idea (watercress sandwiches) and a craft (origami swans). I look forward to seeing her ideas come to life and I hope I get a chance to try my hand at some origami! The Little Kids are going to be listening to their story, talking about Hans Christian Anderson and learning a little about Denmark. Danish Butter Cookies are on the snack menu and one of these little guys will be going home with each little person. The original idea came from Kathy Ross's Crafts From You Favorite Fairy Tales. The kids in this group are very young so I simplified it to what you see above. One adult white sock with eyes drawn on in Sharpie marker ... did you know you had to be 18 to buy Sharpie markers? No, I didn't actually get carded. The little girl behind the counter did ask if I was over 18 and then kind of snickered. Thanks darlin'!... anyway, where was I? One paper plate, cut in half and stapled together just at the corners of the cut side to make a pita pocket shape. Cover it with cotton balls (or feathers if you want) to make it fluffy. 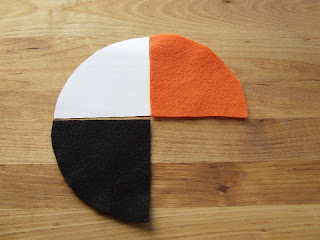 Make two triangles of felt (one black, one orange) with rounded bottoms, using a mini-party hat template. 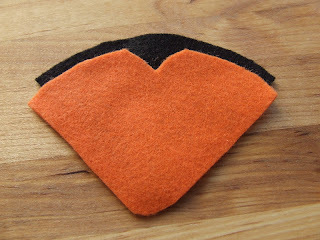 Cut out a notch in the orange felt, round the point of the orange piece and cut off about one inch of the tip of the black piece (so it won't be seen poking out of the finished beak). Glue the orange piece just below the top edge of the black one. Roll the beak into a cone shape (orange on the outside) and secure with glue. I was in a hurry and needed to make a lot of these so I used hot glue. I had no idea the gun was going to go wonky on me. I have a pretty, new white glue gun now with a working thermostat set just below "searing" thankyouverymuch! You can use Alene's Fast Grab Tacky Glue if you want to, if fact, that is what we are going to use to attach them to the socks. All you need is a thick bead around the inside edge. The wings are an "if we have time" option, otherwise they can be added at home later. Crafts with little hands are so cute. Shortcake's were traced on card stock and glued to the inside of the paper plate. We hope to get some suggestions from the Big Kids about future presentations and are going to discuss changing the format a little so that we don't overlap with some awesome feast day celebrations some other moms have planned. That's what we are up to today. Hope you have a great Tuesday! Love this swan. 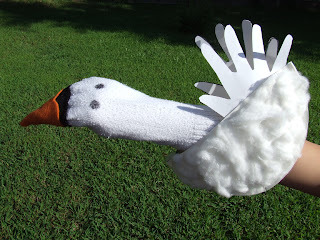 Sock puppets are always a good thing for us, as we have plenty of orphans for the project. Your book club sounds like too much fun! Such cute puppets! I love it. I love that book. The swans look great!